lemforum: Removed backroutes in We're in This One Together (added steel) and From the Other Side (larger fire pit). I credit our contributors in doc/thanks.txt. Let me know if anything there is inaccurate. lemforum/Hopeless: Swapped Bipolar Maniac (now 3rd) and Systematic Separation (now 10th) in Hopeless. 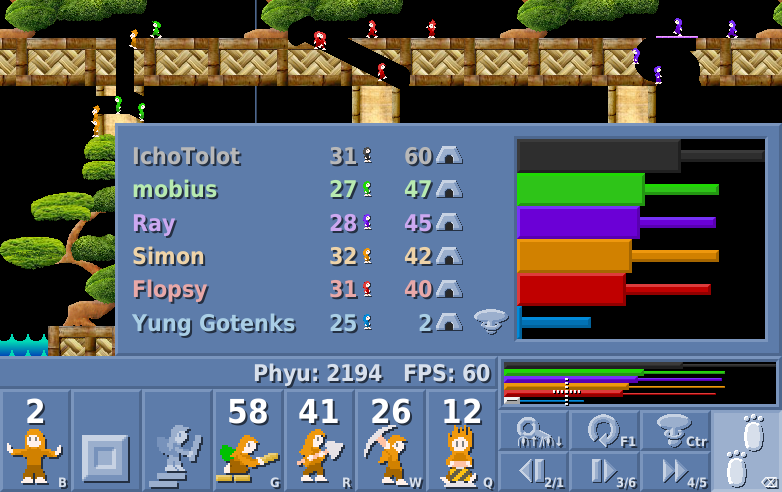 Score board in multiplayer: Hover over the score graph to see player names, exact lix counts, and exact number of scored points, in a large tooltip. See image below. Fix #319: The terrain/steel browsers offer all dirs of depth 2 in images/ at once. After navigating to such a depth-2-dir, the terrain/steel browsers offer in one flat list all tiles recursively found in that dir. Don't save other people's winning replays as your own checkmarks. Correctly save checkmarks after playing levels passed to Lix on the command line. On loading a replay with zero players, don't crash anymore, instead create one player with the singleplayer color. The Windows download contains Allegro 5.2.4 DLLs. These newer DLLs fix any remaining chance that Lix starts without sound when starting Lix from the Windows 8/10 quicklaunch bar. Lix has a new command-line switch --allegro-version to print the version number of the dynamically-loaded Allegro DLLs. Build system: Lix builds with both the most recent DMD 2.080 and with the better-optimizing LDC. I added allegro_color to the link libs. I require D Allegro 5 bindings of version >= 4.0.2 to fix a stack overflow in Debian LDC-built Lix. lemforum: Behind Bars 7/10->8/12 to remove backroute. One Step Off 80/80->20/20. Segmentation Fault 20/40->21/40. Merge Sort, hollow terrain to remove red herrings. Rhapsody in Blue, aligned traps to terrain (removes 1-pixel gaps). Removed obviously unassignable imploders/exploders/cubers according to save requirement. Rubix's levels: Lost Underground, cap reachable ceiling more clearly. Removed obviously unassignable imploders/exploders/cubers. Tiles: Raymanni's improved carnival exit, cleaner large proxima/tiles/orange2. Fix #23: Don't show obsolete replay arrows/pickaxes/sounds when you framestep after a quickload. Fix #346: When you watch a replay, interrupt, and win, the solution replay is auto-saved. Singleplayer exits the level after nuking instead of prompting to framestep back. On display creation, the mouse cursor centers on the Lix window. This prevents edge scrolling when watching replays from the command line. Fix #340: For translations, use format strings (containing %s, %d with runtime checks) instead of several concatenated translated strings. Fix #342: Better grammar, fewer Denglish (English words in the German translation even though good German words exist), add umlauts. Thanks to Wuzzy for this patch! In displayed strings, use typographical quotation marks. In file/shell output, use double quotes both to begin and end instead of asymmetric quotes. You may already be aware, but the link on the main website, as well as the one in this thread, still links to 0.9.17, at least for the Windows build. Thanks! I didn't know. I've uploaded the 0.9.18.
lemforum, some backroute fixes: Get Hype, remove flinging backroute; terrain copied into the repeat Let's All Go Down the Strand. Toccata, use Proxima's backroute fix against a solution that takes 30 minutes. Striking News, add water pit at the top, different cactus placement at the bottom. Behind Bars, save 8/10. Multiplayer maps: Flopsy's shorter Block Chaos, Harden the Paint. Raymanni's Rainbow Road, The Frog-Hotel, Follow the Thread. Fix #354: Prevent the one-pixel-thick line of graphical garbage at the right edge of the map. This line occurred with some noninteger zooms during play/editor. Fix #344: Guideline pieces are selectable from the terrain browser again. Depth-2-directories (e.g., "geoo/construction/") are listed as only the second directory ("construction/") in the root selection of tile browser. Backroute fixes in Continuum Hypothesis and Inside the Fourth Wall. Fewer lixes in Undercutting the Competition. Reshaded rectangular blocks in matt/marble: Shading at the left and top should only become lighter towards the outside. Before, the blocks looked flattened. Diagonal blocks in matt/marble still have this issue. Fix #349: Mirror button icon shows horizontal mirroring with two triangles, not vertical mirroring with an upside-down tree anymore. Removed unused UI graphics: Spawn interval graphic, hint selection graphic, editor hatch direction graphic that is shown with a unicode arrow instead. Fix #356: When you specify -w or --resol=XXXxYYY on the command line, loading/switching the user configuration will not override the command line's resolution in this session. Reorganized the trophy area of the singleplayer browser: Don't draw last game's results over the personal best of lix saved. dub package Optional: I use Optional 0.6.3 now instead of Optional 0.4.x. This requires a recent compiler (I know that 2.082 or newer works) when you build Lix yourself. Fix #255: Trophies (level checkmarks) are associated to levels by the levels' basename (the part of the filename that is independent from directories), author, and English title. Trophies are not associated to full level path anymore, even though they remember that path as extra information. This means that you keep your trophy even when its level moves to a different rank directory. lemforum: Feel the Pressure: Hopeless -> Daunting. This Is a Stickup: Daunting -> Vicious. Evacuate the Sinking Ship: Vicious -> Hopeless. Little Miner Puzzle 1: Adjusted height of one bar to avoid accidental splatting while a miner is working. The Borderland: Added buzzsaw that This Lix Is Your Lix (repeat) already had. Raymanni's Holiday exit: Enlarged sprite at the bottom to look better when the exit sits on bumpy terrain. Fix #359: When you have lost singleplayer and the game tells you to framestep back or abort, you can doubleclick the nuke to quit. Fix #323: Wide, flat torus maps start with less default zoom (you see a larger portion of the level). Editor: All steel is offered in a single flat list. I've sorted the more commonly used tiles to the top of this list. Editor: Removed an invisible extra button that 0.9.20 mistakenly generated and that sometimes became visible when you hovered over the 3 rightmost text buttons in the panel and held the mouse key down. Fix #363: Editor: The terrain browser does not offer the 3 directories ./authorName/steel/, to de-clutter the tileset list. Fix #355: Multiplayer: Exit markers are solid, colorful arrows instead of large lixes. Opponents' exit markers are small crosses. All these exit markers still go behind the terrain. In addition, the outline of your own arrow is drawn semi-transparently over the terrain. The networking menu offers to host a game (a server will run within Lix) and offers to change the port for listening or connecting. Fix #358: In a networking room, the current level title is printed under the preview image, above the chat. License: During the CC0 public domain waiver, I mention explicitly that the levels are CC0. Server executable understands the switch --port <number> to listen on a different port. Server is now its own dub package in ./src/server/ in the Lix repository. Documented how to build and run standalone server executable in Lix's main README.md. Git users: I version-control dub.selections.json now. If you get merge issues, delete your local copy and then pull. Support 64-bit Windows builds with LDC >= 1.13.0-beta2. I encourage all Windows users to choose the 64-bit build over the 32-bit build, hoping to avoid the out-of-RAM crashes on large maps. Binary downloads are now hosted on github, not on Lix's homepage. Binary download archives carry a version number in their filename and unpacked Lix directory. With self-contained Lix (i.e., not installed system-wide via a Linux package manager), you should still update existing self-contained Lix as usual by copying your user files, custom levels, and replays from the old directory into the new. Fix #369: When you build from source and choose a debugging version instead of a release version, Lix will start windowed by default, not with software fullscreen. User options can override this as usual. Updated the DAllegro5 bindings to 4.0.4+5.2.0 and removed Lix's allegro-color dependency on all platforms. Many refactorings in the source code for physics updates. No physics changes. This will be useful in case I manage efficient skill blueprints a.k.a. skill shadows. xmas2018: Fixed backroutes in Home Time for Santa, Snow Cat Love, Decorate the Tree, Past the Xmas Tree. Fix #371: Miners throw a pickaxe again when they cancel on steel. Diggers won't throw pickaxes anymore by mistake when they cancel on steel. Windows downloads call the directory again lix, not lix-versionNumber, for easier quick-and-dirty updating (see "How to update" above). Linux: Added a manpage for Linux package maintainers, doc/lix.6, thanks to tarzeau. Work around bug #372 (garbled exit markers): Removed alpha channel from data/images/goalmark.I.png. Arrow's white overlay is entirely opaque. Made overlay line thinner to compensate for the fully-opaque overlay. This should avoid #372 to trigger at all. Everything should recolor properly. Multiplayer directories: Sort authors with easier multiplayer maps. Easy means that it's easy to save lix against opponents that do nothing. Reason: New players click on the first-listed authors very often. This is not an ideal permanent solution, but we have needed something like this quickly for the Debian 10 release. New multiplayer maps by Flopsy: Cascade Squared (4p, 6p, 8p) and The Storeroom (6p, 8p). Fix bug with _order.X.txt files: When you go to a dir A with order file, then go to a different dir B without order file but with files named like those in A, the files in B are now sorted alphabetically, not wrongly by the order file from A. The options file ./user/options.sdl contains a comment explaining that screenMode 0 is windowed, 1 is software fullscreen, 2 is hardware fullscreen. Added 44 singleplayer levels in levels/single/misc: 17 miniatures by Simon and geoo, 13 levels by mobius (originally called leftovers and non-tutorials), 10 levels by Nessy, 4 non-miniatures by Simon. These levels were released around 2017 and 2018 on Lemmings Forums and are now part of the main download. Added 15 tutorials for basic skill usage. A new Lix installation will still highlight Any Way You Want as first level, not the tutorials. Eased the 2-player multiplayer map Anything Can Work: Removed buzzsaws, added terrain to allow a downwards route without preparatory platforming above exits. Fixed deprecations (silent conversion from size_t to int in loop indices) to allow a warning-free building with the current compiler DMD 2.084. Refactored code for clarity: Alcol constructors -> al_map_rgba_f, magic numbers in EffectManager -> enums. Split ScoreBoard into two classes and moved to the GUI code, to decouple from gameplay. Quick and dirty: Extract over your old installation. Level moves will then result in duplicate levels that remain in your level tree. ...and any levels that you've built yourself or added manually. Added 24 singleplayer levels in misc/lemforum-outtakes. These levels were once part of out flagship pack lemforum, but have been taken out over time. They're all proven solvable with 0.9 physics. Fixed #301: Separated the ping-exit functionality from show-splat-ruler. In multiplayer, there are now two buttons. Both have much clearer icons (an exit with beams, a ruler -- see image below) instead of the generic cool shades. Fixed #293: Savestate icon, don't use floppy disk (means: write file). Now, the icon to save state is a flag, and the icon to load state is a flag with an arrow pointing towards it. Once a savestate exists, the load icon (default hotkey F2) is to the left of the save icon (default hotkey F3), to have their default hotkeys (F2, F3) in ascending order. (Before, load appeared to the right of save). Renamed the level folder "Community Collab Project" to "Collab" for concise breadcrumb navigation captions, preventing abbreviation. Rewrote screen options functions, to rule out a possible source of a crash on macOS (no more try-return-catch, always return outside of try/catch). See issue #381: macOS 10.14: Black screen then crash.